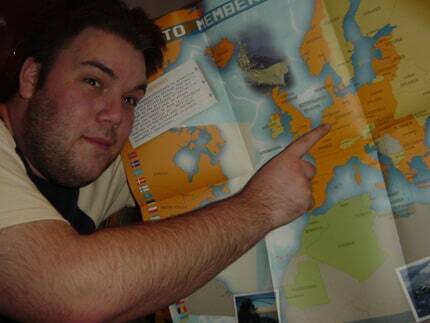 No 2 year old picture of me, that promotional map from NATO simply isn’t detailed enough to help us in The Hunt! Although I am actually quite close to 2 of the locations….. Essentially, ‘The Hunt‘ is geocaching, except with tee’s instead of the usual little packages that you find at sites. I must admit that the two times I’ve attempted to find a geocache I’ve failed miserably (even though one of them was at a waterfall that was about half a mile from my house, I blame it on using a car sat nav for my coordinates). When you find the cache you’re meant to take the tee that’s there and leave another tee, which is a cool idea, except people aren’t all the same size, so a guy in Munich found a cache he left a gift certificate for his tee store (not exactly in the spirit, but a good gesture). Unless you live in a major city then you probably won’t be able to go hunting, but I guess you’ll just have to console yourself that you don’t live in smog! Another thing that I’ve noticed is that this promo from Spreadshirt hasn’t really had much, ummmm, promo-ing from the blog community (though Josh Spear picked it up yesterday), which is really surprising because it’s one of those weird things that can only happen with the internet.